Overwatch League Preseason Starts December 7 | Nerd Much? All Overwatch League teams can prepare for the big competition next year. Overwatch League will begin January 10, 2018, but before then, Blizzard has announced that the Overwatch League preseason will take place tomorrow. Starting at 7:00AM EST on each day until December 10th, you can watch all Overwatch League teams compete in a series of exhibition matches. It’s a kind of practice run, where both Overwatch League teams can prepare for the big competition next year, and likely everyone else involved. The audience will also get a chance to see how their chosen team really plays in a series of matches. The full schedule for the Preseason is linked below, there you can see which teams will be facing off with who. The first match will be between Florida Mayhem and San Francisco Shock. If you’re wondering where Philadelphia Fusion is on the list, there have been some “player logistics issues” and the team is not be able to compete in the Preseason. That said, they will still be coming to the regular season in January. 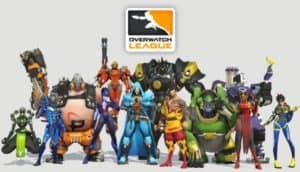 If you’d like to get your own uniforms to show your support for your team, the Overwatch League skins will be available next year as well. They will be able to be purchased with a new and unique currency specifically for any Overwatch League merchandise called League Tokens. As gift to all players, Blizzard will be awarding enough of the new currency for every player to buy their first team skin, or whatever else they would like to show their support. These skins are available for any Overwatch hero and feature all 12 teams involved. Any real money you hand out to buy this merchandise will go directly to funding each team in the League. There is also the Blizzard Gear Store where you can purchase actual team shirts and hats. They are all available now and priced somewhat reasonably for official merchandise. The regular Overwatch League and team shirts are $25 USD, and the team jerseys come in at $60 USD. If you’re not sure where the matches will be streamed, you can take a look at the official Overwatch League site, linked below. Blizzard will be posting the videos and links there.